I love these Christmas papers. They are quietly elegant and with the gold embossed angel even more elegant, even without a bow. The inside sentiment is, "May the wonder and peace of Christmas be yours." I can guarantee we'll all be ready for some peace come Christmas time, a little bit of Peace around the world wouldn't hurt about now either. I used the sketch from Try Stampin' on Tuesday that Lauren used also. This is a new to me challenge and since I missed last week, but used their sketch, I wanted to give them credit here. I'll be adding them to my sidebar so if you need a new challenge to try out they would be a good one. 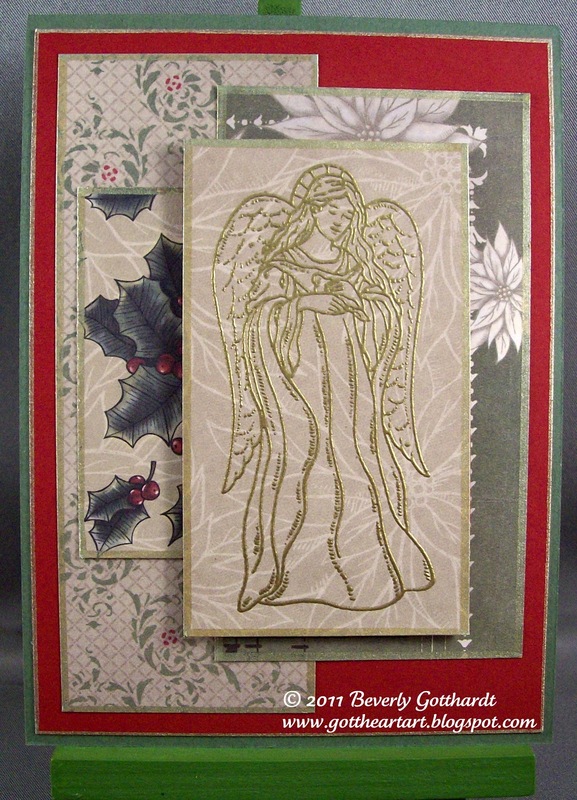 Supplies: Always Aritchoke card blank 4" X 5 1/2", Papers: SU-Always Artichoke, Cherry Cobbler, Designer Series Paper Deck The Halls, Stamp: SU-Angelic Joy, Ink: VersaMark, SU gold embossing powder, Sharpie Paint Marker-gold, SU dimensionals. What a lovely combination of papers ... so perfect for that elegant angel ... so glad you joined our jingle belles fun. This a lovely card.... Beautiful use of layers and that embossed angel is such an elegant touch. Wonderful job!!! & YEAH isn't that the greatest map for doing a LOT of layers?! well, anyone looking at this lovely card can plainly SEE THAT for themselves, lol!